Clear plastic lenses protect posters from dirt and debris. Clear acrylic pockets let visitors easily view titles and headlines. 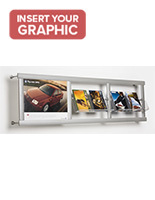 This leaflet display is a stunning wall-mounted unit for dispensing literature. 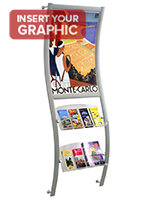 The brochure dispenser, sign holder utilizes its unique shape and poster frame to generate interest in your pamphlet presentation. 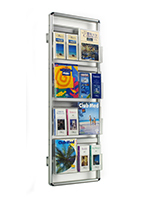 The leaflet display, such as many of our other brochure dispensers, is a great tool for retail stores and office lobbies. A hotel, for example, would also greatly benefit from the addition of this display. Your leaflet display is made up of (2) clear acrylic pockets and a 24"w x 36"h graphic area. The literature dispenser sign holder features adjustable brackets to alter the height and angle of each acrylic pocket. 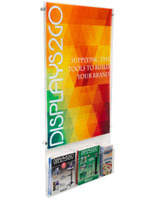 This wave-shaped unit is also a long-lasting, durable leaflet display! 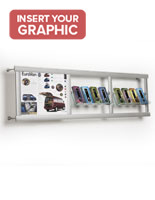 Constructed from brushed aluminum, your leaflet display will resist rust when mounted indoors. 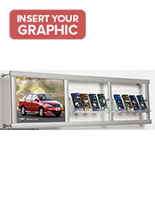 The sign holder, also known as a wall-mounted curved display, will help organize literature in a fun, eye-catching way. 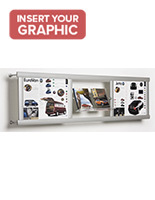 Please Note: Graphic is not included with leaflet display with sign holder. When designing your images, keep in mind the actual graphic size is 24"w x 36"h, where 1/2" on each side is covered. You will also need to provide your own hardware/anchors required to hang items on your particular wall. Your graphics should be printed on regular poster paper, so as to ensure they will fit securely within the grooves. This will not be a problem for any printing service facility. Also, included with your unit is a 5-pocket literature divider for optional use. Although this got here quickly, there are no instructions and the product is very flimsy. I even had our facilities manager come down and help assemble this and we still have not been able to get the poster portion to stay in the frame. We have resorted to taping the poster bar into place so that it will stay sturdier. This looks far more durable, even in person than it actually is and costs too much for the actual quality. We are so sorry to hear that you experienced these issues, Tonya. We'd like the chance to assist and make this right for you. A customer care specialist will be reaching out to get you a better solution. We've also passed along this feedback to our product team for review. Thank you for letting us know, your insight is tremendously valuable to us.